Moleca IT Review 2019: Is Moleca IT a Good Hosting? Moleca IT has been in the web hosting industry for more than 13 years. The vendor seeks to offer quality and reliable hosting solutions backed by excellent customer support. Some of the solutions it offers include: shared web hosting, reseller hosting, and domain name registration. Moleca IT is a Colombia-based web hosting company founded over 13 years ago. The hosting firm hosts more than 5,000 customers from cities such as Bogota, Medellin, Cali, Tumaco, San Andres, Ibague, Barranquilla, Pasto, and Tuluá. The vendor aims to be recognized as a high growth ICT company offering quality hosting solutions. It offers shared web hosting and reseller hosting in addition to other internet services such as web design and marketing services. 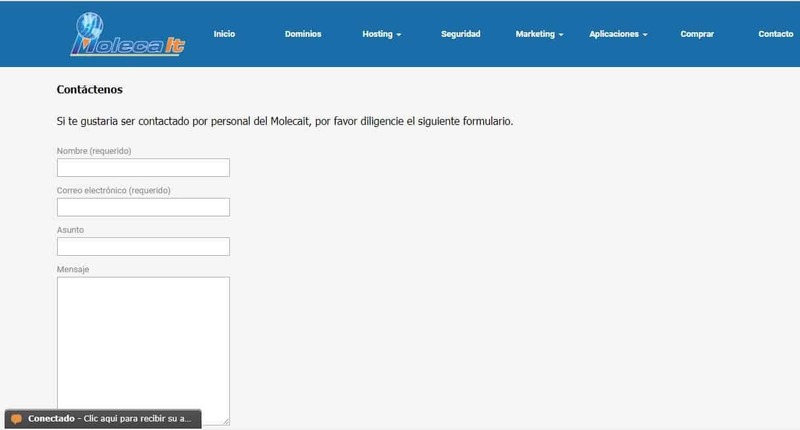 The Moleca IT website is only available in Spanish. Moleca IT’s hosting solutions are hosted on CloudLinux operating system providing high levels of reliability. Its servers are powered by LiteSpeed ​​Web servers improving the loading speeds of the websites it hosts. In addition, the LiteSpeed web servers improve the performance of Apache, PHP, and databases helping them run faster than they would on any other web servers. Moleca IT shared hosting solutions include Hosting Linux, Mega Hosting Linux, and Hosting Revendedor Linux. Hosting Linux is further divide into eight packages. Inicial is the starter package. It comes with a disk space of 1GB and 3GB monthly bandwidth. Corporate 20000 is the premium package and includes 40GB disk space and 160GB monthly bandwidth. Moleca IT offers daily backup services powered by industry-leading JetBackup manager. JetBackup manager uses secure coding protocols offering fast, secure, and reliable backup services. What’s more, with this backup manager, you can easily create and manage backups for your websites. Moleca IT hosting solutions include SiteLock that monitors its clients websites round the clock for potential attacks and vulnerabilities. Moleca IT hosting plans are quite cheap, yet they include a noteworthy number of features with no apparent restrictions. The vendor lists the prices of its hosting plans in Colombian pesos. The plans have inflexible billing cycles; with customers having to commit to a minimum one-year contract. However, the plans include discounts of up to 30% of the hosting price. That said, Moleca IT does not offer any money-back guarantee but it promises 99.9% server availability. Customers can reach Moleca IT’s support team via telephone, email, Skype, and live chat, though the vendor does not have a ticketing system. Moleca IT claims that its customer support is available 24/7. However, my experience was quite the contrary: I unsuccessfully tried contacting this vendor via its live chat, and so decided to try to contact them via email., but never received a response. LAstly, this hosting provider’s knowledge base has only two tutorials/articles. Moleca IT does not have the infrastructure necessary to handle websites of large corporations. Perhaps, that’s why it doesn’t offer VPS and dedicated server solutions. That said, the vendor can comfortably handle websites for small and medium-sized businesses. It has the potential to take even more market share if it can streamline its support team to live up to its promise of 24/7 availability. Join 5,000+ Moleca IT! customers for hosting services today! Wondering how Moleca IT stacks up against other Web Hosting companies? Enter any other Web Hosting company and we will give you a side-by-side comparison.